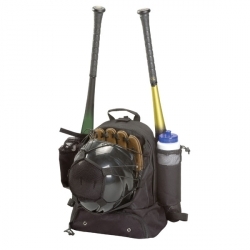 The Champion Sports Baseball Backpack is a great way to transport all of your baseball equipment to the field. This bag features two bat holders, glove and helmet pockets, a drink pocket, as well as a large main chamber and even a shoe and cleat compartment! Complete with adjustable shoulder straps, this bag can also hook on to any chain link fence.